WVV is delighted to boast a cheerful, helpful band of volunteer minibus drivers. This section is designed to give new volunteers a flavour of what we do and what experience/qualifications are required. • Ideally, drivers should be under 70 and most drivers will be able to drive the bus on their existing licence. 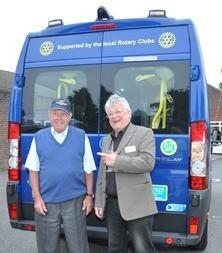 • Drivers will be registered as Wye Valley Volunteers minibus drivers. • Naturally, as drivers are dealing with vulnerable adults, they will need to have a DBS check which will be arranged by WVV and at no cost to the volunteer. • MiDAS training is available to regular drivers at no cost to the volunteer. • Following interview, basic training is provided to ensure familiarity with the vehicle, disability equipment and tail lift. Once a member of the Volunteer Minibus Drivers Team, jobs are circulated via email either to be accepted or declined. There is no pressure to volunteer for a regular slot although such possibilities would be welcomed. The responses to our Coordinator are analysed and rotas are published. The work involves regular shopping trips, transportation of Lunch Club clients, leisure outings and ad hoc drives.